The Booth Playhouse of the North Carolina Blumenthal Performing Arts Center is a courtyard-style proscenium theater with cabaret and theater-in-the-round capabilities. This intimate theater contains 434 seats with seating in orchestra and gallery levels. 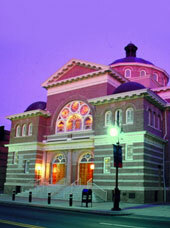 It hosts a variety of dance, choral and other musical ensembles, as well as meetings, seminars, and workshops.